Imaginary Sunshine » Good Saturday? I think so! Good Saturday? I think so! In other news, I got my second math midterm back – I passed (yes!) but not by much (boo). And there’s another math midterm coming up soonish. The term is so close to being done and there’s still midterms to be taken (and a week after I’m done all my lecture midterms, I have my first lab final exam – so unfair). 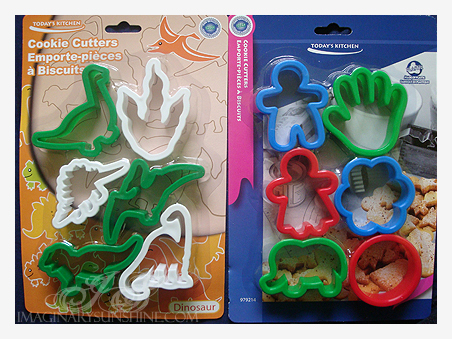 Dollar store find that made me giddy: cookie cutters! They usually never have anything interesting beyond circles, hearts and stars so when I found these ones, I felt really happy. I mean, who doesn’t want dino cookies? Or elephant cookies? Or to bite the head off of a cookie shaped like a boy? Or, more important, making two hand cookies and labeling the left one as ‘right’ and the right one as ‘left’? Good way to screw up all the learning a preschool student has done! Other dollar store finds: butterfly boxes in packages of 8 (all different colours with flower prints! 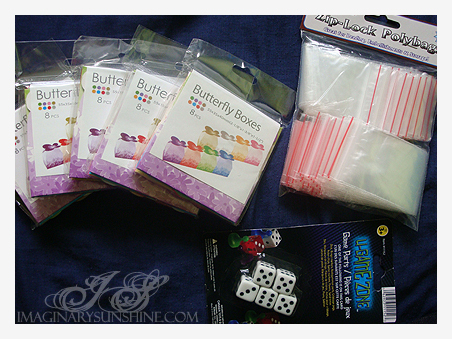 I use these for packaging jewellery), mini zipped baggies, playing dice (package of 5). And then there was Michaels… I forgot to print out any coupons (in my defense, I wasn’t planning on going today! ), so I limited myself to only clearance items. 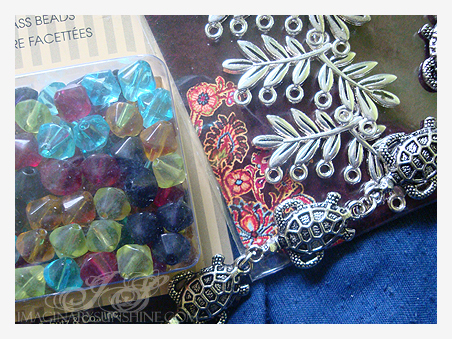 Package of faceted glass beads (120 count, $2.99 from $5.99), metal leaf connectors ($2.99 from $11.99), strand of metal turtle connectors ($2.99 from $5.99). Not shown is a pair of dolly-sized sunglasses (too small though, so I’m returning them whenever I can). I love craft supplies. Especially in the form of beads and connectors (you can never have enough beads, or connectors, if you make jewellery). Ahhh, beads and turtles. What could be better? Those cookie cutters are the most awesome things ever!!! I am always so jealous of people’s trips to craft stores!! aww how cute all the things that you got..love the cookie cutters, even though i am boring and usually just make them regular round cookies!